In the mornings, how long do you wait before you eat breakfast? Do you eat breakfast? When pressed for time or just not feeling hungry enough to eat, please don’t make the mistake of skipping breakfast, especially if you’re trying to lose weight, avoid weight gain, or trying to eat for optimal energy. Eating breakfast not only provides the fuel to start your bodily engine, but also can help improve mood and cognition. Nutritionists tell us that a good way to break the fast and gain high energy in the mornings is to eat 1-2 servings of fruit with high-fiber foods, including oatmeal, whole grain bread or high-fiber cereal. Adding a low-fat source of protein will give your breakfast added staying power and help level out blood sugar levels. And no, my friend, your almond croissant and Skinny Cinnamon Dolce Latte from Starbucks won’t do. The ideal time for breakfast is within an hour of waking. You can start the clock once you get out of bed, not the first time you hit that snooze button! However, the sooner you feed your body, the better. When you don’t have something to eat within the first hours of daily activity, you’re much more likely to over eat later in the day. This brings us to lesson number two (Hara Hachi Bu) of nine from the Blue Zones, five unique communities that have common elements of diet, lifestyle and outlook on life that have led not only to an amazing number of years lived, but also a better quality of life. As children, many of us were taught to clean our plate before leaving the table at mealtime. The reward for doing so was dessert or simply the ability to leave the table. I was a picky eater as a child, so I never did like this rule as the amount on my plate was often determined by someone other than me. I try not to follow this practice with my son. I don’t believe that style of eating has anything to do with what his body needs, how full he is, or how he would feel if he took one more bite. Instead, I want him to learn from an early age the practice of listening to his body and following its cues when it comes to food. One practice of eating we can learn from Japanese centenarians in Okinawa, a Blue Zone, is hara hachi bu. This old adage means to eat until you’re 80 percent full. Most of us have no idea what 80 percent full feels like since we often eat until we’re 100 percent (or more) full. Okinawans centenarians say hara hachi bu before every meal to remind them to eat moderate amounts of food. While most Americans eat until their stomachs feel full, Okinawans stop as soon as they no longer feel hungry—an exercise in mindful eating. As Okinawans instinctively know, the amount of food we eat is less a function of hunger and more a matter of our environment, that is, what’s around us. Overeating is often due to not eating healthy balanced meals at appropriate times and is also made convenient due to circumstances—friends, family, smells, emotions, holidays, occasions, distractions, containers, cupboards…the list goes on and before we know it, we’ve eaten a whole bag of chips! Mindless eating. Yes, sadly I’ve been there…. As the secret to eating right for the long run is emulating the environment and practices of the world’s longest-lived people, my husband and I now practice hara hachi bu. It serves as our reminder to stop eating when we no longer feel hungry and believe to be 80 percent full. Of course it helps to eat healthy food as well, but simply learning to eat until you are 80 percent full can do wonders for your health and well-being! People who serve themselves at the counter, then put the food away before taking their plate to the table, eat about 14 percent less than when they take smaller amounts and go back for seconds and thirds. Learn to recognize wen you have enough on your plate to fill your stomach 80 percent. Retire your oversized dinner plates and big glasses. Instead, buy smaller plates and tall, narrow glasses. The size of our plates and glasses are said to have a profound impact on the amount we consume. With smaller plates, you’re likely to eat significantly less without even thinking about it. You might notice that antique china plates are much smaller than dinner plates often made today. Be cognizant of the size of your plate. Avoid tempting foods. Don’t stock the offenders. Some foods we eat automatically in whatever quantity we have on hand. If you can’t be content with just a handful of nuts, don’t keep them around you! Wrap tempting leftovers in an opaque container. Eating faster usually results in eating more. Slow down and allow time to sense and react to cues telling us we’re no longer hungry. Do not watch T.V., read the newspaper, send emails or surf the internet on your computer, iPad or any other electronic device while you are eating. If you’re going to eat, just eat. Think only about what you are eating, smelling and savor every bite. Practice putting down your utensils between every few bites, describing to yourself the flavors and textures in your mouth. Many of us eat on the run, in the car, while walking or while standing in front of the refrigerator or kitchen sink. This often means we don’t notice what we are eating or how fast we are eating it. Make a habit of eating only while sitting down—eating purposefully. This helps to better appreciate the tastes and textures of our food and we’ll eat more slowly and feel more nourished after a meal. All Blue Zone residents eat their smallest meal of the day in the late afternoon or early evening. Their biggest meal of the day is typically eaten during the first half of the day. Next post: Lesson three from the Blue Zones, won’t you join me? I make oatmeal or some form of a supergrains porridge for my family every morning for breakfast. My son loves it, often wanting to eat it several times during the day. The recipe here is gluten-free. 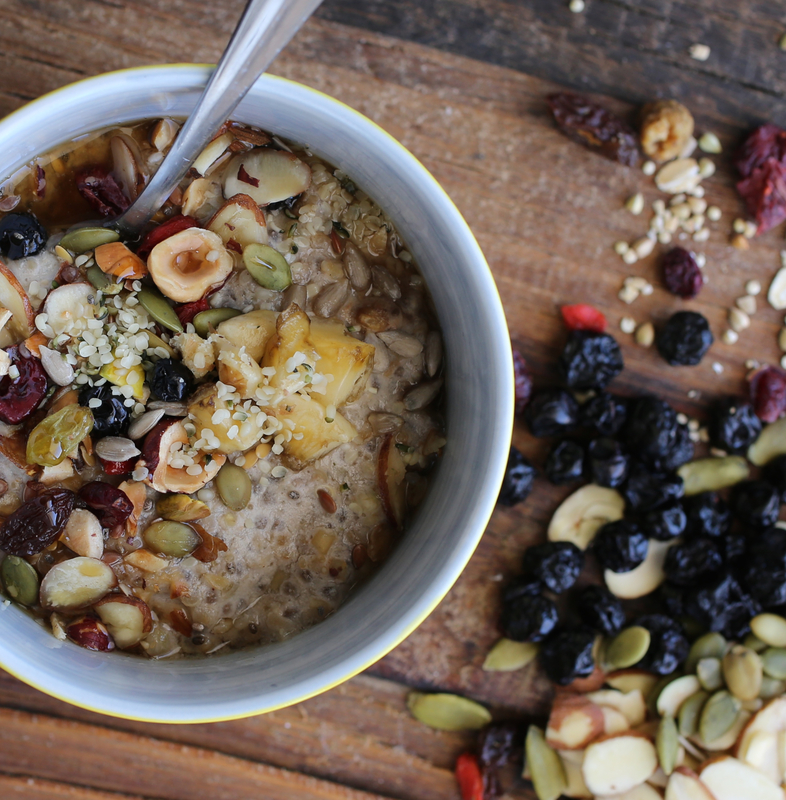 If you have issues with eating gluten, be sure to use gluten free steel-cut oats and rolled oats. As steel-cut oats require more time to cook than regular oats, if you start with unsoaked steel-cut oats, it will take about 35 minutes to cook them thoroughly. 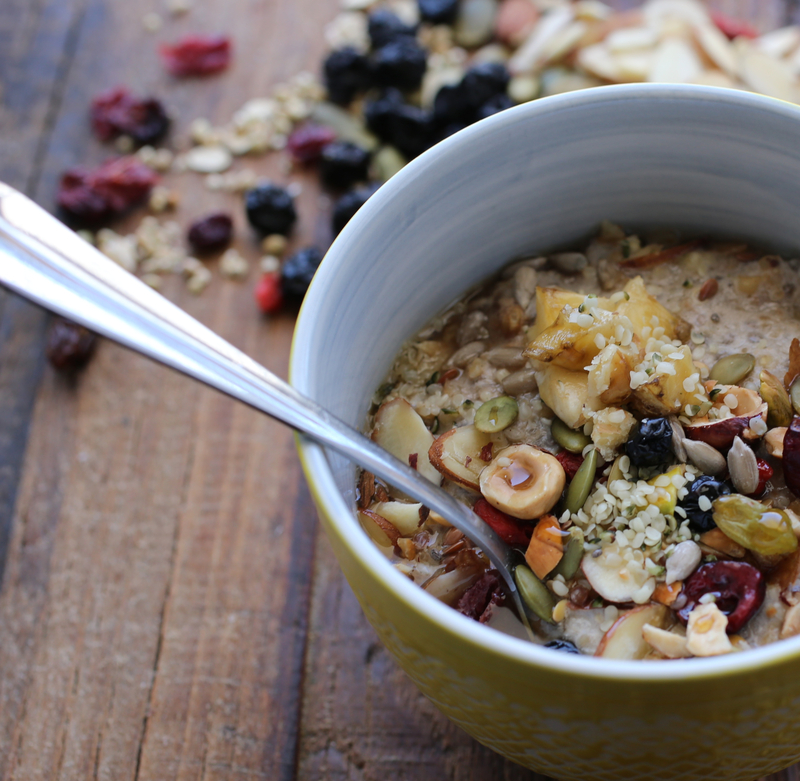 Cooking time can be lowered to less than 10 minutes if you soak oats overnight. As quinoa is added into the mix, it is important to rinse your grains before cooking, if you will not be soaking overnight. Also, amaranth (a pseudo-grain, like quinoa), a supergrain used here, is packed with vitamins and minerals and is great for making porridge because it turns slightly sticky when cooked in liquid. I added a large variety of toppings in the photos here. Feel free to add as little or as much, in whatever combinations, that suit your preferences. For my two-year-old son, I often add ground walnuts or nut butters to his porridge for added protein. Combine 2 cups of milk, supergrains and chia seeds in a large saucepan and bring to a boil. Reduce heat to low, add vanilla, cinnamon and nutmeg and simmer, stirring occasionally until milk is absorbed and oats are cooked thoroughly, about 35 minutes (about 10 minutes if grains were soaked overnight). If necessary, add milk as it cooks to achieve desired consistency. The porridge should be thick and creamy, and the grains tender. 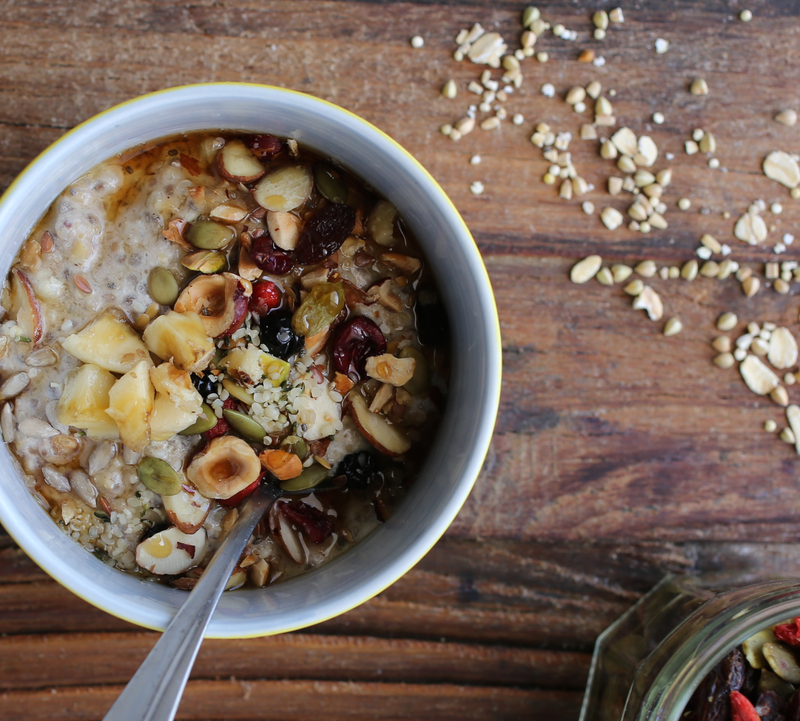 Serve the porridge topped with a combination of your favorite nuts, seeds, and dried and fresh fruits. 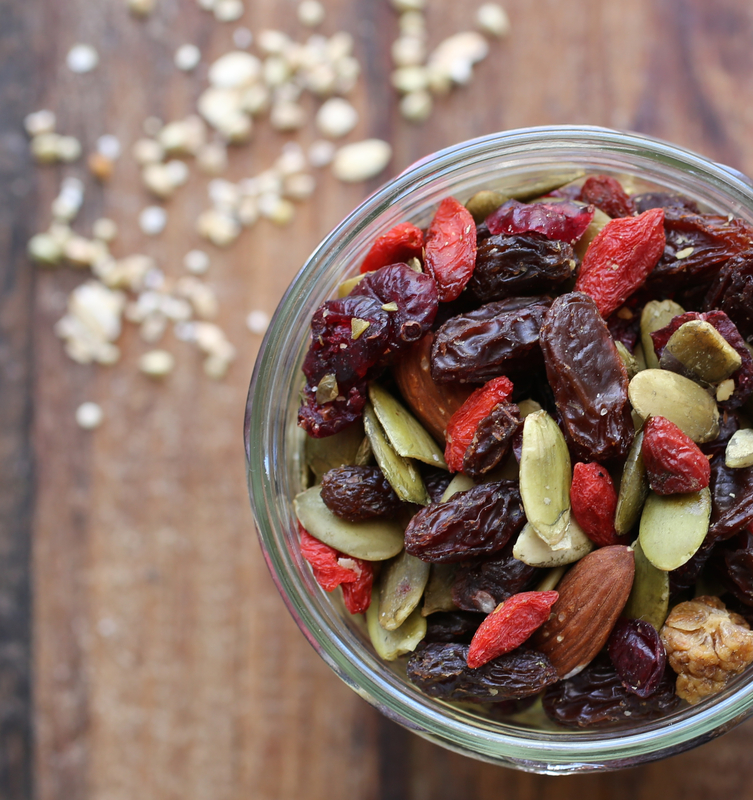 Some options include dried raisins, apricots, currants, dates, cranberries, almonds, walnuts, pistachios, hazelnuts, and sunflower, flax, sesame and pumpkin seeds, etc. Drizzle with more milk, if you like, maple syrup or honey. Place all ingredients in a container with an airtight seal. Stir until combined. Seal tightly and store in a cool, dark place. Notes: If you soak your grains overnight, you can start cooking them with a little less milk (1 1/2 cups). If you don’t have issues with gluten, some other grains I sometimes use in my blend are oat brain, and wheat, barley and kamut flakes. Sometimes, I grind a combination of pumpkin, sesame, flax and sunflower seeds—in equal portions—before adding it to my porridge. If you would prefer to cook your dried fruit with your porridge, feel free to do so. 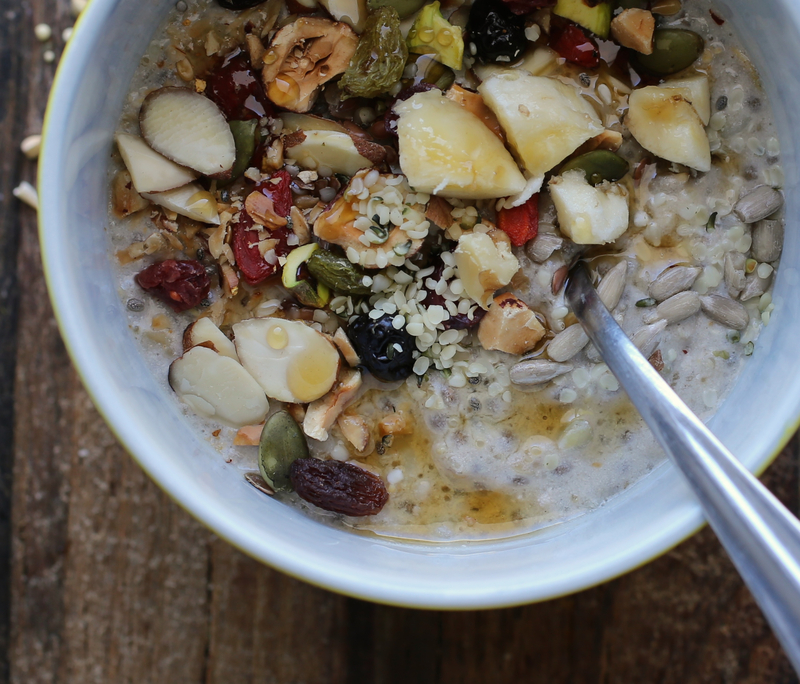 Make this super healthy breakfast porridge your own so it really works for you! I loved this post! So informative, structured, beautiful and delicious food! I am trying to teach my kids to listen to their tummies too. Thank you so much Sonal! I was afraid it might be too long…. So happy to know that you enjoyed this post, and the recipe. We try to listen to our tummies and I try to listen and respect my son when he indicates he’s had enough. I love it when he says “hara hachi bu” to let me know he’s all done. As for the porridge, we really eat a version of this every morning. Good luck as you train and educate your kids! Great post. I will try to make it a point to leave my phone in the other room at meal times. Silly that it is hard to do.. Cute your babe says hara hachi bu when done. Thanks. I totally know what you mean about the phone and meal times. It can be a challenge! Awesome! Thank you! We have this or a version of it every morning! A very nice post. Soo informative. I skip my breakfast most of the time. I will definitely try not to do that. 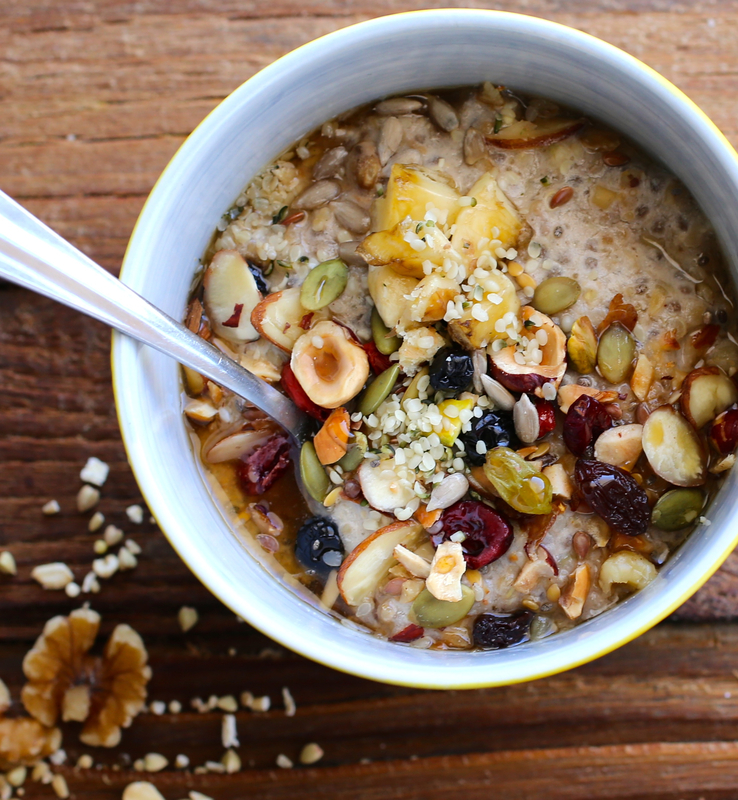 This porridge looks crazy good. Thank you Sadia! I wish you the best in trying not to skip breakfast anymore. Even if you just eat a little, it will be much better for you. Glad you like the porridge. We eat a version of it every morning. My son even likes to have more during the day!